Home Décor > Flower Vases. 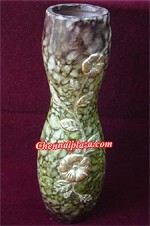 Item Description Cute looking vase with attractive design carved into a flower, gives a very elegant look, measures about 7" x 3". 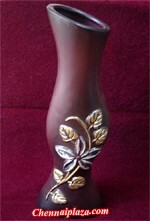 Item Description Fabulous looking artistic designer flower vase in brown & green colour having a golden colour creeper motif, beautiful decorative for your living room, measures about 12" x 4". 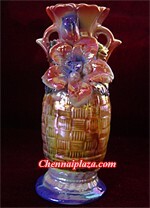 Item Description A classic looking flower vase in brown colour having a golden-silver colour creeper motif, beautiful decorative for your living room, measures about 12" x 4". 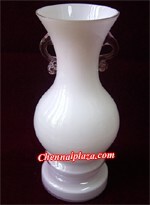 Item Description Very Elegant looking flower vase in light pink colour having plain surface, beautiful decorative for your kitchen, dining table or the sofa table, measures about 8" x 4".